Michael is a Managing Partner and Chairman of the Executive Committee for Meridian Compensation Partners. For six years he was Hewitt’s global practice leader for executive compensation and corporate governance consulting prior to the spin-off of Meridian. 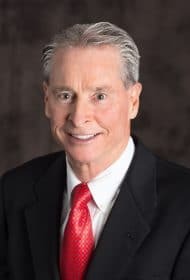 Michael has over 25 years experience consulting on executive compensation design issues, including substantial experience at the board of director level. Michael has testified to Congress, the SEC and the FASB on executive pay and governance issues. Michael serves many Fortune 500 clients in the following industries: Capital Goods, Consumer Services, Food and Beverage, Health Care Equipment, Consumer Services, Household Products, and Retail. Michael is a member of the Compensation Committee Leadership Network and a frequent lecturer at national conferences and author of many articles, including in the Equilar C-Suite and Directors & Boards magazine. Michael also was recognized each of the last five years as a member of the NACD Directorship 100, for expertise with corporate governance matters. Michael is an attorney and was a licensed certified public accountant.